I just realized it's been ten years since Rossetto exploded into my musical awareness with the amazing trio of releases, 'Misafridal', 'Imperial Brick' and 'Whoreson in the Wilderness'--a highly enjoyable decade of rich, surprising music. 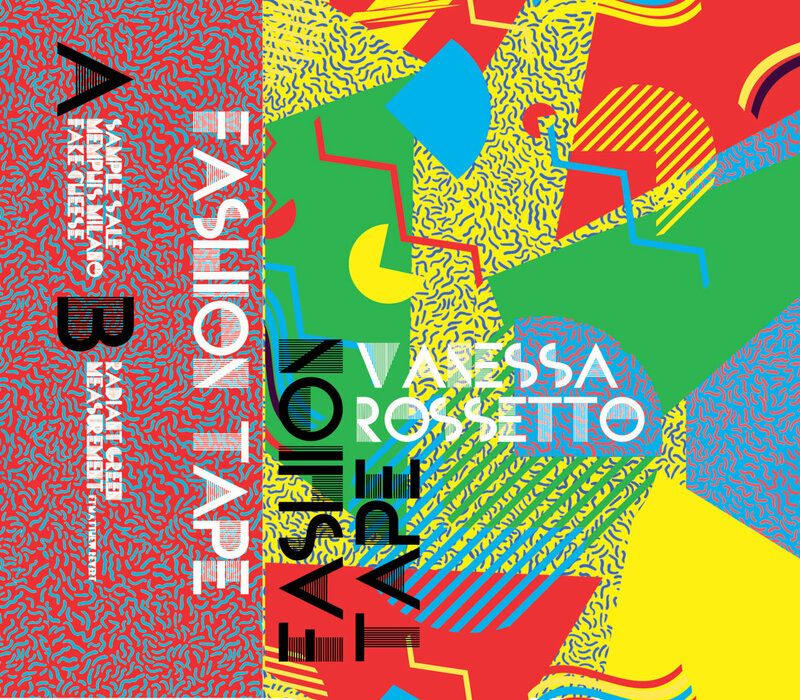 I've missed a few of her most recent recordings, so I'm not sure how/if 'Fashion Tape' fits into the sequence or not, but it's yet another (to me) slightly unexpected direction, perhaps mostly in its usage of taped voice as a major element. 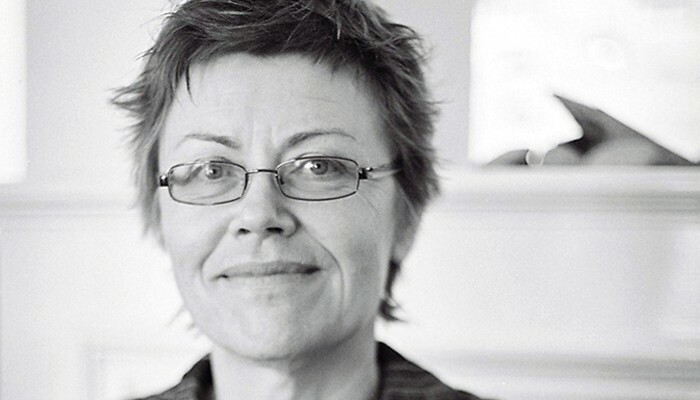 Rossetto has frequently used a combination of field recordings or other found sounds and music from either electronics or her own viola playing, the latter often imparting an unexpected and welcome melodic, even Romantic, element. In this collection of five pieces, a cassette release, the recordings tend to predominate, though I think the viola lurks just below the surface now and then. 'Sample Sale' begins disconcertingly with a mechanical, quasi-poppy sequence, a looped rhythm that's tinny and artificial-sounding, all the more so when a female voice (Rossetto's?) utters, "Welcome, please come in. This is a demo." in a detached, icy manner. We're then ushered into a public space, occasionally bristling with shards of electronics, filled with distorted voices, distant Muzak, complaining children and more. It's a space filled with sounds but somehow not dense; more ghosts than bodies. Swirling, metallic electronics scour the area clean of any human presence before the scene shifts and voices reappear, but hazier, more muffled, half-hidden beneath the sound of clinking, like a spoon in a metal glass. The choices are poetic, unsettling and hard to quantify but work marvelously. This longer track and the concluding one bracket three briefer pieces, three to four minutes in length. 'Memphis Milano' is the most disturbing one, a synth-y looping sequence bearing a vague similarity to buzzing insects, that maintains a mechanical regularity of rhythm while fluctuating in pitch, dynamics and number of lines but for all that, sounding like a reminiscence of some of the more aggravating examples of 1960s electronic music experiments. 'Fake Cheese' returns us to the environment explored in the first track (perhaps the intermediate cut was a kind of buffer or transition zone), the hubbub of the marketplace buried even more deeply under a thick, cottony thrum of electronics through the middle of the piece before emerging somewhat more clearly amidst harsher static etchings. A paranoid sounding man speaks of escape and culpability--again, disquieting and quite strong. A different male's voice, sounding as though from Arkansas or thereabouts, begins 'Radiant Green', again seemingly troubled, going on about perceived manifestations of the titular color as well as white light, hiding from the truth and other defensive obfuscations. He wanders off, one imagines, and the sounds of the mall remain, serene and undisturbed, slowly gaining in volume and intensity before crackling apart. Rossetto's voice (I think) opens 'measurement', a track on which Matthew Revert also contributes, by repeating the title word in several layers. Once again, a man's voice enters (Revert's?) apparently doing some multiplication exercises. Beneath, there's the strongest possible evidence of Rossetto's viola or some other string source, very muted and quite poignant, like a fresh stream flowing under the mall's floors. The general sound-world morphs into something more "natural"; one hears birds, perhaps the chittering of other animals--it could just be a pet shop, though. The strings intensify and indecipherable voices are heard as the environs become more complicated, even hallucinatory. It's an amazing piece, every move both surprising and solid. Rossetto creates an eerie mini-world that one feels extends well beyond what she's happened to include in the recording, no mean feat. 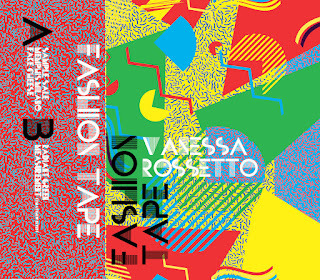 'Fashion Tape' is a very fine addition to an already seriously impressive body of work. Give a listen. Shiroishi's 2014 recording on Confront, 'White Sun Sutra' was pretty interesting, showing a range of approaches to his saxophones among other things. 'Ima' picks up from there and then some. 'Lunar Bloom', the first of two tracks, has as its main stem what sounds like a taped voice, deep and very distorted, writhing through the piece, augmented by percussive sounds that carry, for me, a ritual aspect of some sort, and Shiroishi's alto which here has a vocal feeling to it and which, in fact, changes to pure voice toward the piece's end. It's dark enough to seemingly make the adjective 'meditative' inappropriate, but that's the overriding sensation I derive. A strong work. 'To Bathe in the Dreams of Fireflies' opens in an area that belies its title, a fairly disturbing, roiling kind of rumble, like a large reptile whipping around in some subterranean pool. Gradually, wisps of alto and light percussion ('spoons' are listed on the instrumentation--this could be it), provide small glimmers of illumination. You're then thrown entirely off balance by taped orchestral and choral music that sounds Chinese in origin to these ears, like some group spirit that's suddenly coalesced in the gloom. There's a very cinematic cast to everything, sonic images emerging an disappearing from the throbbing and growling, the chorus and orchestra returning, the alto gaining some strength. The whole piece begins to accumulate mass and surge ahead, debris collecting on all sides, before finally expiring with a handful of wheezes. Very impressive and unique, recommended. This cassette is quite different. Referencing the Tule Lake internment camp, where his grandparents were imprisoned, it contains a very personal set of pieces. "Herni" opens as a rapid-fire alto exercise in Parker-esque (Evan) cascades including some circular breathing but settles into a ballad-like sequence in the sax's lower range, not unlike some of Braxton's songlike solo pieces. Toward the end, I believe the horn is played into a piano--very nice (in fact, I think each track at least ends in this fashion, maybe more often than that). "The Screams of a Father's Tears" wells up in full-throated roars and harsh stutters, a raging juggernaut, very strong of its type. It simmers down only slightly before returning even more stridently than before. "Form and Void", on baritone, recalls in its first few minutes Roscoe Mitchell's "Eeltwo" a bit in character and deep mournfulness. The dirge-like melodic material is repeated over and over, gaining passion and pathos on each iteration. The note sequence grows quicker, looping and swirling. 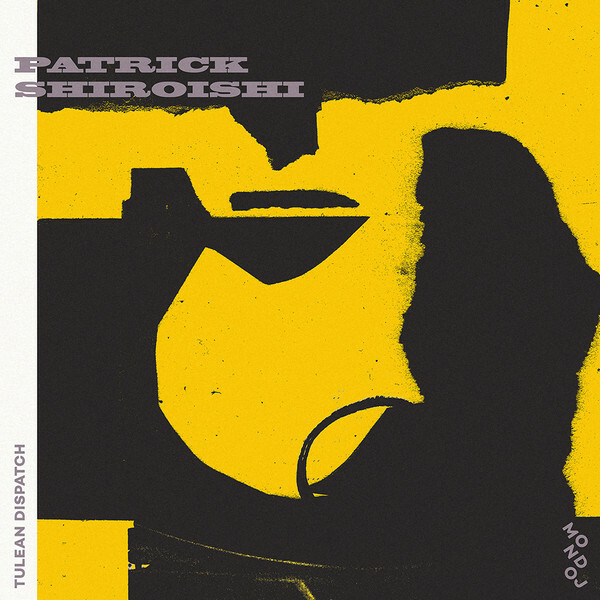 Shiroishi's tone is full, rich and fluid; it's a joy to hear him plumb these depths, even as the anguish threatens to swallow the listener whole. The brief, "The Flowers And Candles Are Here To Protect Us" closes the tape, a lovely ballad that almost touches on "You Go to My Head", heartfelt and intensely moving. As I said, quite different from "Ima" but every bit as strong and well worth hearing. As much as I love it, I generally find it very difficult to write about Eva-Maria Houben's music. There's an apparent simplicity about it that's air-like; how to describe air currents? In fact, the first listed of the releases appears to be a joint project, possibly a collaborative composition by Houben, Rebecca Lane and Samuel Dunscombe playing, respectively, organ/piano, bass flute and bass clarinet. The piece, 'observing objects', is played twice, once with organ, once with piano. It consists of sets of long, overlapping notes (the bass instruments tending toward the low, the organ varying higher and lower pitches) interspersed with silences, though the latter are filled with the ambient sounds of the recording space. If there's a regular pattern with regard to the entrances and durations of the tones, I can't discern it. As with much of Houben's music (and, perhaps, with that of Lane and Dunscombe), one has the vivid impression of human breathing--not regular, in this case, but within the normal boundaries of inhalation and exhalation. The irregularity of the sequencing imparts an inference of sensual and/or intellectual preoccupation, as though the musicians' attention is gently moving from object to object, observing them and giving a commentary that has been reduced to a single tone. The lines are pure and beautiful in and of themselves and become more so, and gain stunning complexity, when they happen to overlay one another, like looking through translucent panels of colored glass that generate unexpected hues. Difficult to describe, very easy and satisfying to experience. Though the structure remains at least roughly the same for the second version (though the silences seem longer--one hears birds just outside) the initial sharpness of the piano attacks and their decay makes for a very different, no less invigorating experience. It's a stunning recording. As is 'voice with piano', wherein a number of shorter pieces are sung by the extraordinary Irene Kurka, accompanied by Houben. 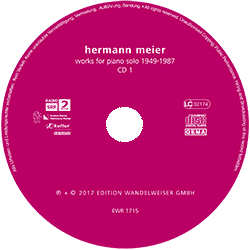 The disc is in three sections: 'adagio' (three pieces), the standalone 'lyrik' and 'lieder für die insel (songs for the island)' (five pieces). Much of the music evokes, to my ears, early music though nothing I could put a finger on. Each of the trio of songs in 'adagio' begins with solo piano, stark and somber but glowing, before Kurka enters--also solo--singing the text by Felix Timmermans, poems dating from 1947, with clarity and strength. She sings, apparently, into the piano--one hears its strings resonating beautifully. A breathtaking set. Hilde Domin (1909-2006) provides the words for 'lyrik'. The music remains dark, Houben striking low, ominous single notes, Kurka singing above though seemingly weighted down by the deep tolling. I'm unfamiliar with Domin's poetry, but her escape from Nazi Germany (her husband's family was murdered there) seems to hang in the air. Houben herself contributes the text of the final set, five pieces lasting three to four minutes each. Keeping with the tenor of the album, the music remains sober; old stone walls, cold to the touch, come to mind. The piano notes are often held for quite a while, mixing with and eventually overtaken by the quietly bristling ambiance. As on 'adagio', the piano begins on its own but this time remains with the voice and after the singing is over. There's a near-symmetry in effect on each song, the piano acting as a kind of floating platform upon which the voice emerges for a few moments, then subsides. Kurka's 'chants' was one of my favorite releases last year; this is bound to be one of this year's top recordings. 'adagio' and 'songs for the island' are included on 'voice and harp' as well, performed by Tatiana Kuzina (soprano) and Christine Kazarian (harp). It begins, however, with a piece titled 'aeolian harp', though the instrument in question is clearly being activated by something with far great plucking power than wind. Whatever the case, it's a lovely piece, almost in a "traditional harp" mode, with wafting arpeggios set off against occasional deep thrums, every so often tempered by "sourer" notes that add wonderful depth and a tinge of doubt. The three "adagio" songs follow. Perhaps it's partially the harp as opposed to the piano, but the tone is distinctly different--less dark, less earthy, more ethereal (I think Kuzina might be singing into the harp; I assume that's indicated in the score). "hatid", with text by Houben, is an extraordinary 8 1/2 minute work, once again staying in the same, softly somber territory as elsewhere here and on the album with Kurka, the voice alternating with harp, Kuzina's long, somewhat sad tones contrasting superbly with the delicate plucking. As on the second reading of 'observing objects' the piano a bit more vibrant than on the other works here, but Kuzina's slightly airier voice imparts the two songs with both a mistier and, perhaps, more melancholy feeling--equally as striking as the Houben/Kurka versions. As are the 'Songs for the Island' pieces--it's fascinating to hear the two readings. If I slightly prefer the piano it's likely just an inborn instrumental prejudice on my part. The music itself, more importantly, is so thoughtfully conceived, so clear, that I imagine it could be rendered on any number of instruments (and I'd love to hear it). All three of these Wandelweiser releases are deep and moving. Moreover, they might serve as fine initiations for those previously unfamiliar with Houben's work. 'breath for organ' is very different from the above, especially the two releases with voice, but will be familiar enough to those listeners who have prior experience with Houben. She's done a great deal of music for organ and, to my mind, this is one of her very best. Houben played this on (and perhaps wrote it for?) the pipe organ of the St. Franziskus Church in Krefeld, Germany. It's also an example of how difficult it is to give any sort of description that does justice to the experience. The piece contains long sequences of sound that are more air/breath than notes in any traditional organ sense, although at times one hears those tones around the edges. Sometimes the sounds approach that made by train whistles; more often it's as though steam were being released through a vent that has a tiny amount of metallic resonance, imparting the barest hint of a tone. Occasionally, it sounds like two tones are played simultaneously, but I'm not sure. Importantly, this is all embedded in the ambience of the church itself--there are spaces between the tones, but never silence. I hear it as somewhat akin to 'observing objects' except that the sounds are less related to breathing and more individual episodes or glances emanating from the same being. I have the image of a large, semi-mobile pipe organ, anthropomorphized into a gigantic, slow-moving creature, using sound to sense its way around the church, inch by inch. It's bare yet rich, simple yet endlessly engrossing. An amazing recording. 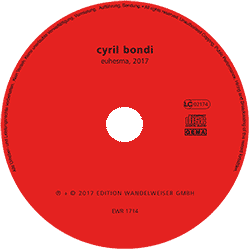 Issued under Bondi's name, he's joined by his Diatribes partner D'Incise on this composition, the former playing Indian harmonium, melodica, harmonica and pitch pipes, the latter Indian harmonium, electric organ and melodica. From the instrumentation alone, you get the idea that you're going to be experiencing, among other things, some rich drone-oriented music and yes, that's one aspect of 'euhesma, 2017'. Euhesma, incidentally, is a genus of bee and one wonders whether at least part of the piece is a meditation on that species' apparent decline in the world. On the back cover of the disc,"(apocrita 3)" is appended to the title, apocrita being a suborder of Hymenoptera that includes wasps, bees and ants. 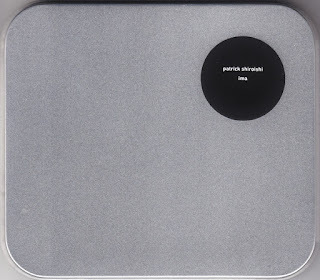 The interior of the CD package bears a difficult-to-define photographic image that seems to be an overhanging eave constructed from interlocking pieces of wood. I suppose slowed down bee buzzing could be a reference as well and it's a tempting one especially as light clattering (presumably from the pedals of the harmoniums) that occur throughout but more audibly toward the work's conclusion summon up, at least to these ears, the hyper-amplified clicking of apian legs and antennae. Bur possible programmatic allusions aside, we have a wonderful series of overlapping drones from subtly different sources. Over the course of the work, there's a (very) gradual (and happily inconsistent) densification of tones, going from relatively sparse with spaces left between sounds to the last several minutes where there's almost a fanfare-like effect achieved. The tones are always transparent, though never gauzy--I'm sorely tempted to call them honey-like--evincing a wide array of floral pollens. 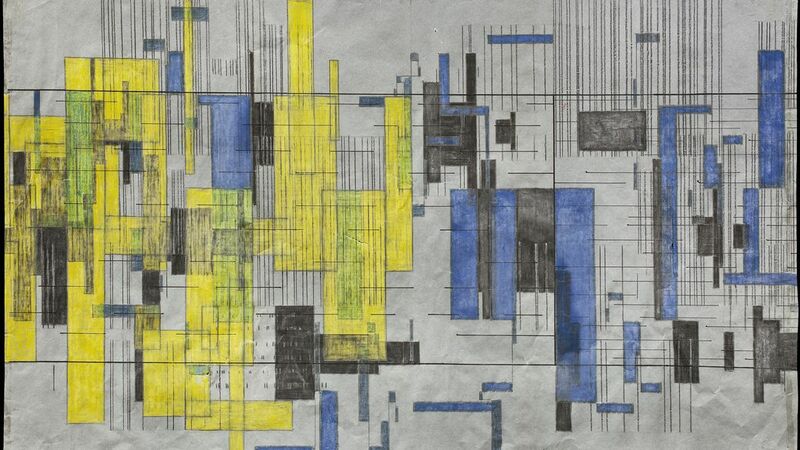 The tones remain within a circumscribed range, the better to appreciate their variations, and overlap in irregular, consistently fascinating ways. And there's just enough sourness applied to forestall any worries of the overly harmonious. It ends simply, with no fanfare at all. In 2000, Edition Wandelweiser released a recording of Meier's music, "Works for Solo Piano" performed by Dominik Blum. The current release comprises the complete solo piano work of Swiss-born Meier (1906 - 2002), once again recorded by Blum, this time in 2017. The pieces on this 2-CD set date from 1948 to 1987 with much of it from the earlier portion of that period (just two pieces from 1968, one from 1987) and they range in duration from a minute (oddly listed here as 0' 60") to over twenty-six. They're not presented chronologically. On the surface, and perhaps beyond that, one might think that the music is somewhat out of place in the Wandelweiser catalog, though one piece is dedicated to Urs Peter Schneider, who has several releases on the label. Meier apparently developed a kind of graphic scoring system (image below) though it's not indicated whether or not this was in use for any of the compositions heard here. I don't know nearly enough about this area of music--post-twelve tone structures, etc.--to pretend to be able to comment even semi-intelligently about it and can only offer my impressions. The works from the mid-50s, like "Klavierstück" (1956) seem rigorous, forthright, even strutting in nature, quite volcanic and jagged, very dense. The work that follows, "Klavierstück für Charles Dobler" from twelve years later, while still extremely forceful, seems to allow for a bit more breathing room--some cloudy chords midway through are wonderful--and to at least allude to more pastoral possibilities. Actually, the earliest composition, the three-part "Sonata für Klavier" (1948-49) also seems to retain vestiges of a more Romantic approach. Perhaps there was a "progression" into the severity of the 50s, maybe influence of Darmstadt, and then a mild retreat? Then again, the one piece played here twice, to close out each disc, "Zwei Klavierstück für Lilo Mathys" (1955-56) has its share of space and delicacy intermixed with harsher thrusts, so I imagine the notion of Meier's "progress" is more complicated than that. The previously mentioned minute-long "Kleine elegie für Gaby Stebler" (1968) floats dreamily--stunning. It somehow makes me want to hear any work by Meier for chamber ensemble. 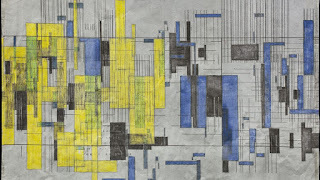 The work dedicated to Schneider dates from 1987 and while still as spiky as anything else in this collection, seems to refer, if obliquely, to song forms with melodic fragments buried beneath a rough and scabby surface; reminds me, slightly, of some of Rzewski's work from around the same period. The restatement of "Zwei Klavierstücke..." is delightful, stressing a series of staccato moments, allowing them to hang in space briefly, like icicles. As said, the music falls outside my normal ambit but, given that, I throughly enjoyed it. Would be happy to get the opinions of those more conversant with this area. If you look closely at the above image, you'll see a lengthy binary string. This is a subset of a "maximally complex, incomputable number" known as Chaitin's Constant, or "omega", after the mathematician Gregory Chaitin. Michael Winter has used this string, in a manner far beyond my ability to comprehend, as a seed for his piece, "for gregory chaitin", one of two presented here. An intriguing work and an interesting album overall. I may not be 100% convinced by this particular usage of math-related material, but it's certainly worth a listen and generates curiosity on my part for hearing further work from Winter. 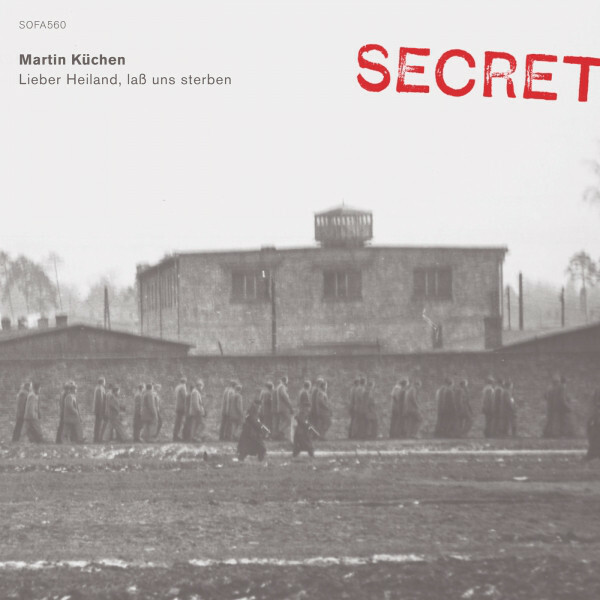 Martin Küchen is among the most thoughtful of saxophonists. His solo work often involves thematic content and one suspects he deeply considers his approaches to that content, even as (I imagine) a good portion of the actual playing is improvised. 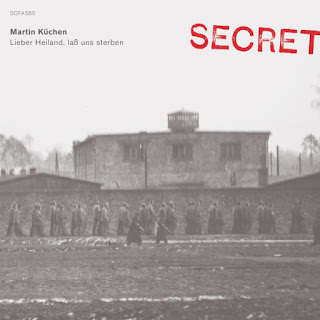 The title translates as "Dear Saviour, let us die" and the cover image is a photo taken at the Jaworzno concentration camp in Poland, a sub-camp of Auschwitz. While used by the Nazis in the final two years of WWII, it was also subsequently utilized by the Soviet Union under Stalin as well as the People's Republic of Poland to incarcerate, and often kill, ethnic Germans, dissident Poles and Ukranians and other "enemies of the state" until 1956. The death toll there is estimated at almost 7,000. The photo was taken in 1951 by a member of the UK Embassy and classified as "Secret". In addition to his alto and baritone saxophones, Küchen employs radio, iPod, electric tambura and speakers. He also overdubs on two tracks, including the haunting title piece that opens the recording. Mixing breath and spittle tones with soft, descending laments, it's a ghostly dirge fitting in perfectly with the cover image--very moving. 'Music to Silence Music', for solo alto, interpolates low key pops with various quiet but extreme sounds, evoking (to these ears) a kind of forlorn resignation, a muted cry. Both of these pieces are fairly short, offering dark glimpses into the setting. 'Purcell in the Eternal Deir Yassin' (Deir Yassin was a 1948 massacre of over 100 Palestinians by Zionist forces) begins with the surprising sound of a tambura soon joined by a fluttering saxophone that, indeed, seems to refer to Indian singing or string playing in the alap portion of a raga. The immersive feeling is wonderful, the pale flutters like pigeons in the recesses of a large, dim chamber. Eventually, one discerns a faint voice, female, emerging from the shadows (presumably Purcell, though I'm not adept enough to identify it positively--'Dido and Aeneas'?). It's like a response or a summoning, beautifully underplayed, the spirit circling around the edges, becoming more or less distinct, wavering. A fantastic piece.